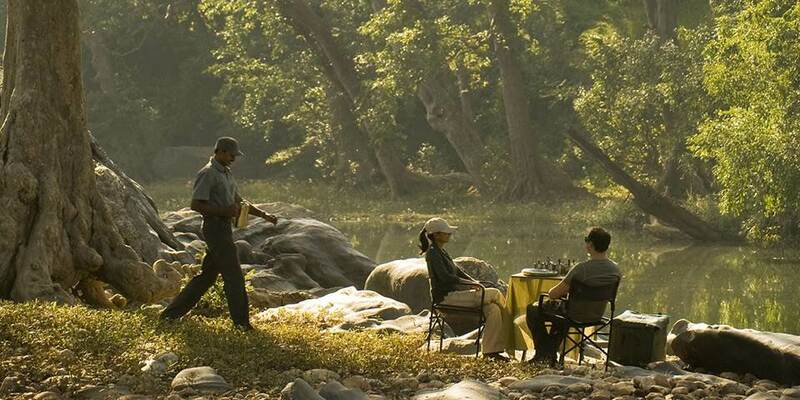 Kanha National Park in Madhya Pradesh is one of India’s largest areas of pristine wilderness. Situated in the Maikal Hills of the Saputra range Kanha boasts a spectacular landscape of vast sal tree forests, interspersed with flourishing green meadows and stretches of lush bamboo growth. It is here right on the edge of the Banjaar River that Banjaar Tola is located in a 90 acre private concession overlooking the core zone of Kanha National Park. Our naturalist and perhaps the odd macaque greet guests on arrival. Then the excitement begins - after proper refreshment of course. After suitable orientation, depart on an afternoon drive through Kahna’s timeless landscape, traversing lush green meadows and skirting large bamboo stretches while keeping an eye out for tigers and barasinghas, a type of deer found exclusively in northern India. Travel in comfort in a Tata TL open 4x4 safari vehicle, specially designed for use in the Kanha National Park or maybe spot tigers from the safety of an elephant’s back, indulge in twice-daily safaris in the reserve, tick off Kahna’s ten Star Birds (a book listing the area’s top ten birds that bird-watchers can check off) or just absorb the sights and sounds of local villages. Inside the lodge, guests can linger over coffee and a book in the intimate lodge café. 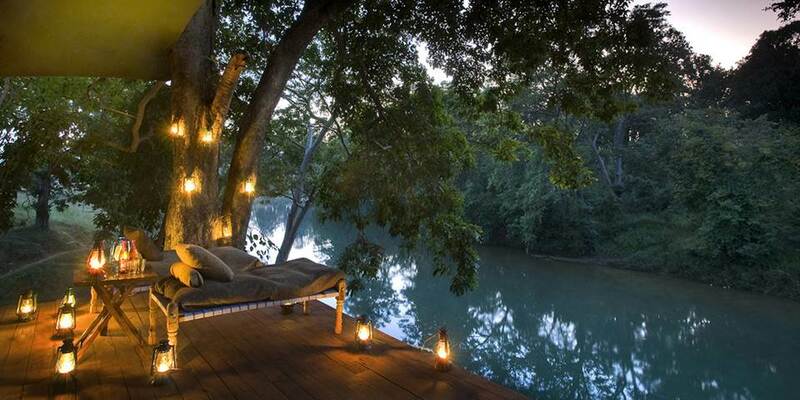 Or one can browse leisurely through the Safari Shop, and then take a dip in the refreshing swimming pool. 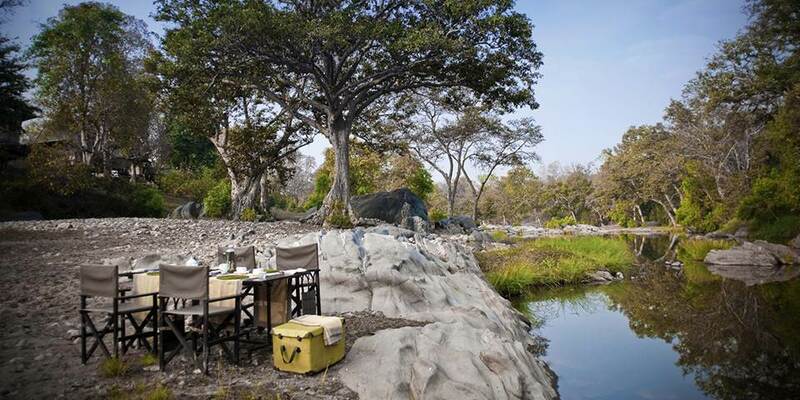 Dining in Banjaar Tola is as wonderful and exotic as the safari itself. No menu is ever the same and great care has been taken by the chef and the staff to celebrate the unique flavours and styles of the region. At dinnertime, enjoy a wok style dinner by the poolside, an “Angithi” dinner in the dining room, where guests can assist in cooking their meals, or a riverside dinner on Chowkis, which are specially-created decks. Private dining by the tents is always an option as well. Jungle Banquets are lavish affairs with bullock carts loaded with kitchen treats. Guests will be given shawls to wear and the area will be heated by sigris (traditional coal heaters). Hyderabadi cuisine is featured, with the food cooked in the traditional degs and haandis and sealed with Atta (whole wheat flour dough). Each guest will be presented with their own sealed haandi that will be opened with a flourish, releasing the aroma of the spices. At the end of the meal, the Chef pedals in a dessert cart filled with signature Banjaar Tola sweets served with South Indian coffee. 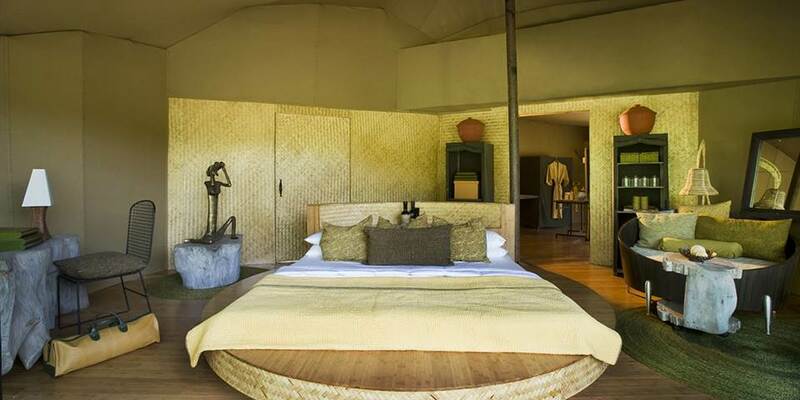 The lodge consists of two elegant and intimate camps of just 18 tented suites, 9 in each camp. The lightweight tents have been designed in a contemporary chic camping style using locally sourced materials. Each suite has canvas roof and walls and bamboo floors, with glass doors leading out onto a spacious deck and each has its own bath and shower. Interiors showcase the rich block-printed cottons and silk handwork that is native to Madhya Pradesh. Woven textiles in shades of bleached saffron, forest greens and earthy cinnamon surround guests in the colours and textures of the region. Instead of conventional electrical units, the tents are designed with double layers of canvas with insulation materials and air gaps to keep them cool. In winter, hot water for the bathroom is piped under the insulated bamboo floor. The eco-friendly air conditioning system uses a reversible cycle to efficiently deliver both cooling and heating. 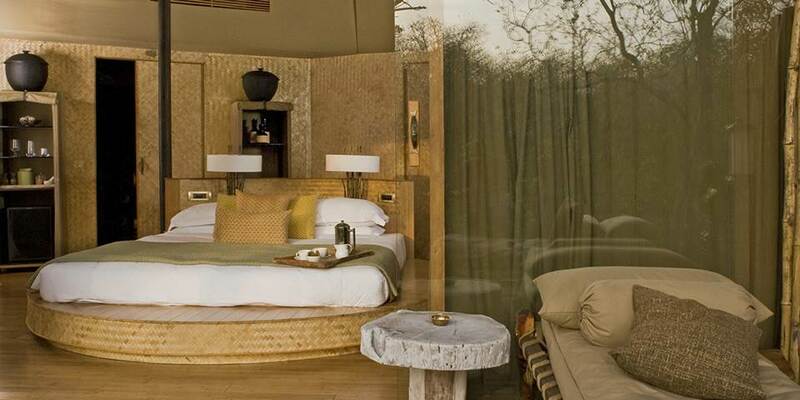 Taj Hotels has reinvented the safari tradition with an earth-friendly experience that’s also unforgettably luxurious. This lodge was built with standards that maximize the positive impacts on the local environment with a minimum ecological footprint, while still providing the ultimate style and comfort.